RACHEL THOMPSON , our featured artist paints in oil on canvas. Her work covers subject matter from floral and foliage to living creatures and people. She is known for her vibrant colors and close-up view of her subjects. VICTOR KOWAL paints in oils in exquisite detail and is well known for his Henry Flagler Era depiction of some of Flagler’s most famous hotels and churches. Kowal is a master at architectural detail and studied in the styles of the master’s paintings. HENRY VON GENK III is one of Northeast Florida’s premier Landscape painter’s. His works are highly collected nationally. Marshscapes of the Florida lowlands, tidal creeks and estuaries are finely detailed and perfect representations of the important backbone of the Florida Ecosystem. KATHLEEN MULLHOLLAND is a watercolorist who paints palm trees, water lilies, Koi, florals and birds nests. 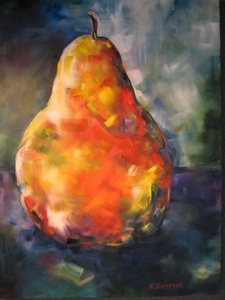 She also uses acrylic; guache, pastels and a batik look process on her mixed media pieces on Arches watercolor paper. PETER LEVENTHAL paints his uniquely classical approach in oils on canvas. Now residing in San Miquel Allende, Mexico, Peter’s works are highly sought after in the U.S. market. BRUCE ANDREWS sepia tones are his signature photographs along with his color works printed on fine watercolor paper and canvas. ART Rachel Thompson Gallery is based in historic St. Augustine Florida. The Rachel Thompson Gallery represents some of the area's finest artists. We represent a wide selection of original artwork, giclee reproductions and photography. In business for over nine years we have an excellent reputation within the art community. We fill a particular niche with our full service approach to art. We do all we can to assist our clients in finding the perfect choice for their art and framing needs. Our services include on site consultation, installation, research and acquisition of specific works of art, custom framing of art and mirrors, commissioned work and referrals for art and frame restoration and service to Interior Designers. INTERIORS To expand upon our art services we also offer interior decorating services with Leah Russell, an interior design graduate of the Art Institute of Ft. Lauderdale. Rachel & Leah combine their design skills to offer a team approach to your decorating needs. GRAPHIC DESIGN With 25 years of experience, Rachel Thompson can help you solve your marketing needs with a visual solution that works.